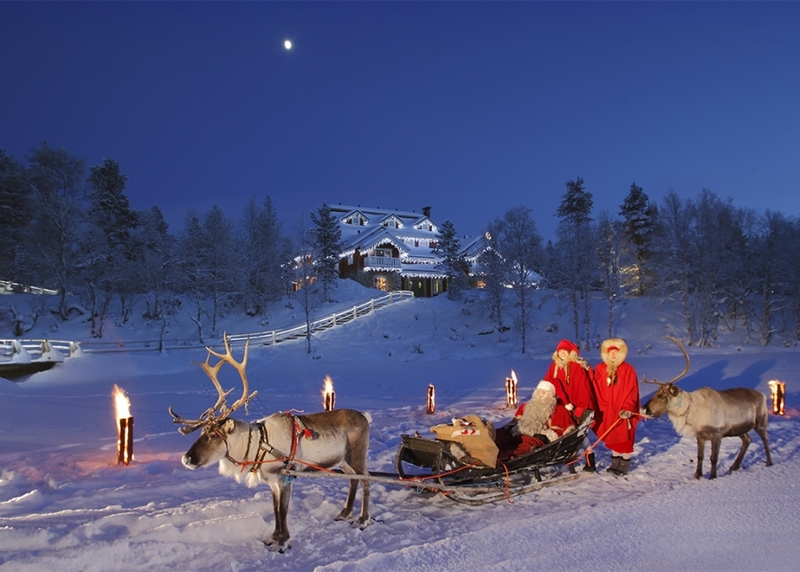 The forests, fells and lakes of Northern Finland are the perfect setting for your winter honeymoon or romantic short break. 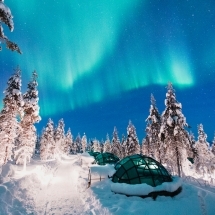 At 68° North, Finnish Lapland offers a climate that sees seven months of snowfall and over 200 nights of Northern Lights activity. Here reindeer roam across the fells and husky dogs are eager to take you on a trip into the wilderness. You’ll stay in a luxurious Queen Suite log cabin offering privacy and relaxation throughout your stay. The holiday or honeymoon will be customized to your preferred combination of activities and accommodation. Arrive in Finnish Lapland travelling to Ivalo in the North of the country. Transfer to your luxury accommodation and settle in to your Queen Suite cabin which includes a cosy fireplace, private outdoor hot tub and sauna. Dinner will be served in the restaurant. After dark, wait to see if the Northern Lights appear in the night sky. Kakslauttanen Resort is located at the edge of wilderness in Finnish Lapland, 250km north of the Arctic Circle. The hotel is open year-round and is a great base for enjoying snow-bound adventures by dog-sled, snowmobile, horse-back or reindeer. Meals are served in the rustic restaurant in the main building where there is also a bar and lunchtime café. By the river there are three smoke saunas, one of them being the largest smoke sauna in the world. At the end of the jetty you can take a dip in the cold water – a hole will be cut in the ice if necessary! Kakslauttanen Resort provides different types of accommodation over two sites: the East and West Villages. 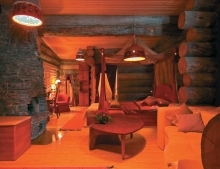 Log Cabin: Traditional Finnish log cabins come with at least one double bed as well as bathroom, sauna and a fireplace. Glass Igloo: The glass igloos are perfectly positioned for star gazing from your bed, and if you are lucky, for seeing the Aurora Borealis. The igloos have a toilet and twin beds, with showers and sauna in a separate building nearby. Snow Igloo: Spend the night snuggly wrapped up in a snow igloo at a cool -3 to -6 degrees. Experience the deep slumber aided by the fresh cool air and the muffled quiet of the igloo. Queen Suite: Queen Suite log cabins are spacious and luxurious. 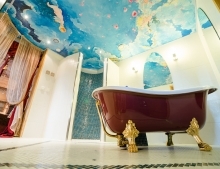 They have a four poster double bed, bathroom with roll top bath and shower, fireplace and outdoor hot tub on the terrace. Wedding Chamber: Stay in a ‘kammi’ earth lodge with turf roof, hidden in the forest. 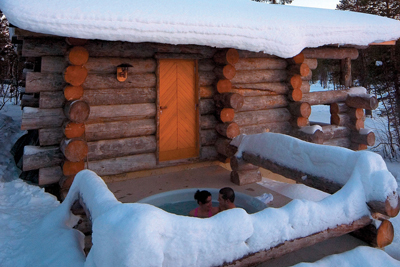 These romantic hideouts have a private sauna and bathroom with bath and shower. Tradional House: Sleep in a traditional Finnish house almost a century old. The house sleeps two adults and two children and has an open fire and a private sauna. Sivakka: Sivakka sleeps up to ten people in three bedrooms. 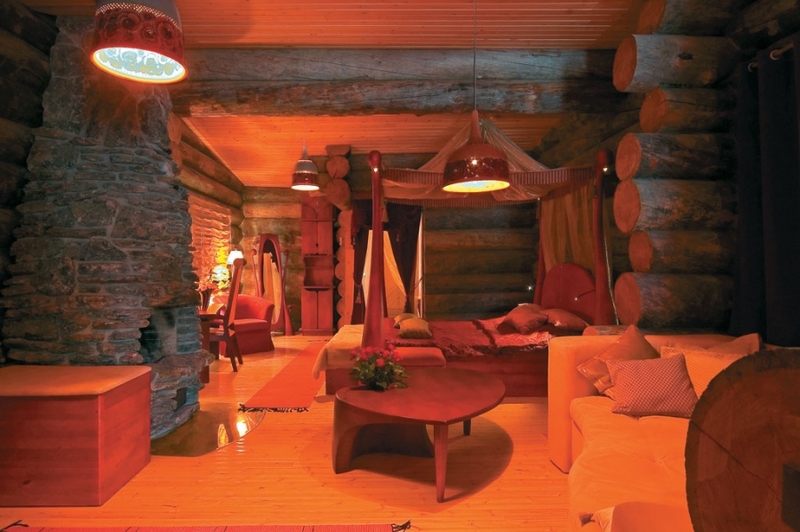 The log cabin has a large living room, kitchen, snug fireplace room and sauna. 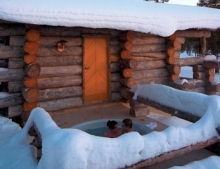 Kelo Cabins: Enjoy the best of both worlds: a cosy log cabin complete with glass igloo frontage. The Kelo Cabins sleep up to six guests in one double bed, one bunk bed and a twin bed in the igloo section. All cabins are equipped with bathroom and shower (with hairdryer, towels, shampoo and shower gel), sauna, log fireplace, and kitchenette. Today will be as action-filled or as relaxing as you desire. Join a classic Arctic adventure at the nearby husky farm. Drive your own team of husky dogs through the wilderness and enjoy the moment when silence falls and your dogs focus on the forest track ahead. In the evening, we'd recommend an exciting adventure to hunt the Northern Lights by snow mobile. The lights of the snowmobiles will illuminate the snow as you head into the wilderness. You'll stop for a drink of hot berry juice and if you're lucky, you may view the dance of the Aurora Borealis in the night sky. 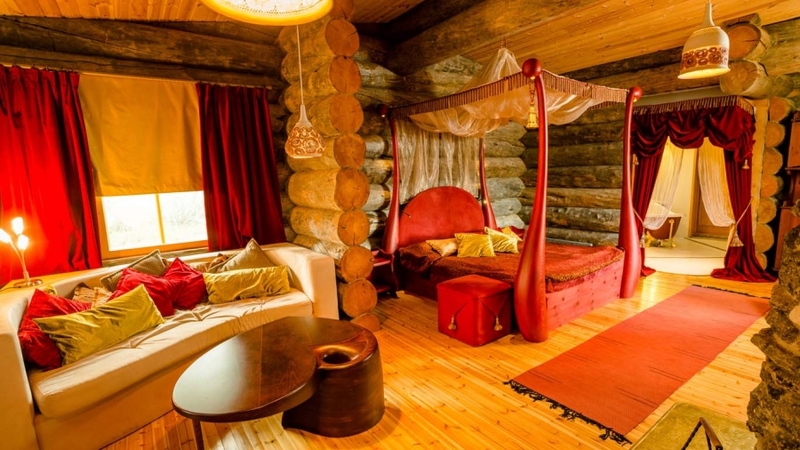 Another day of adventure awaits, or simply relax in your luxurious but cosy log cabin. Kakslauttanen is located in a region populated by Sami people, many of whom herd reindeer. If you'd like to get to know their culture first hand and meet their herd, we'd recommend joining a reindeer sledding adventure today. In the evening, why not continue your search for the Northern Lights by private horse sleigh complete with glass of bubbly in hand. A romantic and unforgettable experience. After breakfast you will transfer to Ivalo Airport. Alternatively, why not add extra nights either in the log cabin or extend your stay with the final night in a glass igloo. 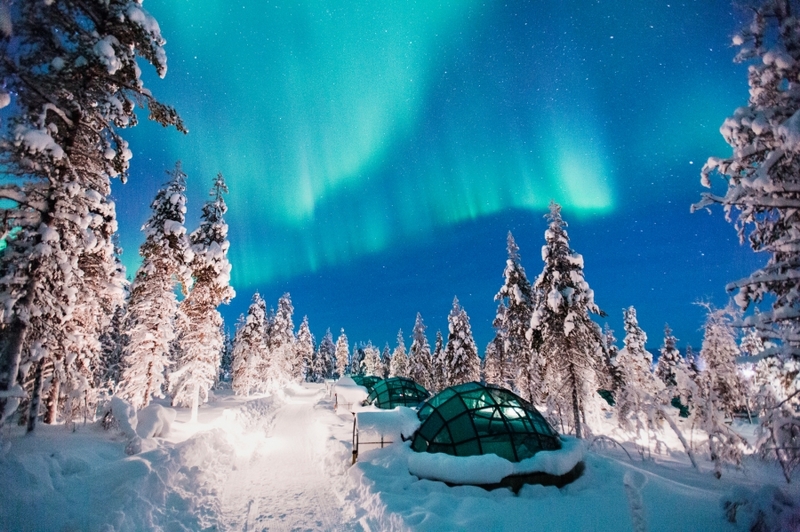 The glass igloos provide a stunning panoramic view of the night sky. If you’re lucky you’ll watch the dance of the Aurora from your bed or simply enjoy dense star-filled skies. 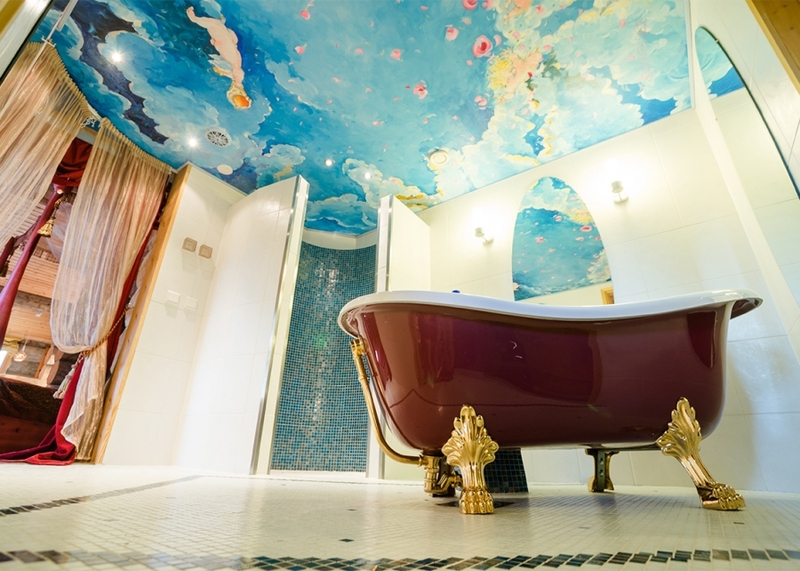 The price for this holiday starts at £1495 per person for three nights excluding flights. The itinerary can be tailored to suit you with extra nights and activities. Why not combine the best of both worlds and stay in a Kelo Log Cabin, which features a log cabin section as well as glass igloo frontage with beds in both parts.